Like a pirate radio transmission from some collapsing Afro-Caribbean wormhole, the L.A. producer's Brainfeeder follow-up is more space static than cosmic songcraft. Though hardly the first of his kind, Steven "Flying Lotus" Ellison makes weirdness somehow cool. His records are critically acclaimed, his visually intense concerts frequently jam-packed, his reliable Brainfeeder imprint formidably curated. Through that latter effort comes the artist known as Ras G. Like his peers in the thriving beat scene, the Los Angeles producer makes brainy, unconventional sounds with tenuous, tentative ties to hip-hop. Tempting Afrika Bambaataa and Sun Ra comparisons begin with head-dressed appearances and end with interplanetary intentions, abruptly. Though not entirely wordless, Back on the Planet stays mum on mission statements and space opera narratives, because, quite frankly, Ras G evidently lacks both. A glorified beat tape, for better or worse, it plays out like a pirate radio transmission from some collapsing Afro-Caribbean wormhole, broadcasting the sort of intemperate tinkering one might tolerate from a Wolf Eyes side project. (The grating squelchy title track opener doesn't reward patience.) Such low-rent art world experimental music appreciation suits our times of rapidly experienced millennial feels and compounding on-demand Soundcloud streams. The temptation, however, to invite such an experience for 44 middling minutes is, understandably, mild. Of course, the beat scene is by definition self-indulgent, insularly self-serving and teeming with audio clutter and data detritus, and, yes, Ras G need not be pilloried for the community's wider, perceived transgressions. Beauty, oft experienced in momentary bursts and fleeting passages, has made the growing catalogs of artists like Teebs or Sweet Valley worth exploring, on repeat no less. 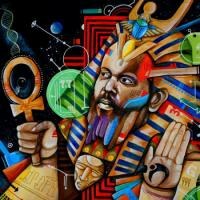 Though not without his merits, Ras G shatters upon anything more than delicate comparison to those superior and admittedly disparate talents. Cripplingly dependent on aesthetic and congenitally short on substance, the Back on the Planet ride is nonetheless sometimes worth cutting the line over. "Jus There" samples both Ice Cube and Robin Harris in its opening breaths. The Eastern loops of "Been Cosmic" fleetingly bleed into the red like Muslimgauze toppling Mr. Oizo. Following a DJ's shout, "G Spot Connection" dips delightfully into degraded aquatic tones. Spurts and spasms of luxurious sound and compelling reference, however, do not make for a great album and, mostly, the record plods. Undermining its slinky title, "CosMc Lounge Kisses" instead conjures fire alarm drones, analog squiggles, and tape gurgles. "Natural Melanin Being" preaches black empowerment served over dank two-note approximations of church organ, but it is almost embarrassingly alone. Albeit more obliquely, with childlike utterances and maternal instruction, "Children Of The Hapi" attempts to carry over the theme to ancient Egyptian roots, but it too fails. Beatless and bored, "Asteroid Storm" broods over lite power electronics and needless snippets. Perhaps we are too far from the Avalanches' solitary debut to remember that a patchwork of samples can yield more than the vulgar sum of its lumpen parts. Back on the Planet is about as cohesive as any other Brainfeeder record of late, though the least coherent. Where labelmates like Lapalux and Thundercat connect with listeners (albeit for dissimilar reasons), Ras G appears aloof and disconnected, his self-ascribed Afrikan Space Program incapable of reaching the cosmos at this time.